Had a search of the forum and I couldn't find this topic being covered elsewhere. I thought I'd open up a thread for films / characters in films where there is some skirting going on. Breakfast On Pluto. Cillian Murphy is an abandoned child in Northern Ireland who is raised by an abusive foster mother. He is caught out cross dressing and misbehaving at his Catholic school where he expresses his feminine side. Watching this part of his early life, I was reminded of reading the Eddie Izzard biography - seeing a male deeply affected by the absence of a mother and connecting to her by dressing as a female. The is an adaptation of a book which I feel may have been a lot grittier than the film turned out. There is still plenty to like in the film though - Murphy's acting (as well as that from the support cast) is top drawer. I loved the music and they did what, to me at least, looked like a good representation of early to mid 1970's Ireland and London. I was Wombles mad as a kid and it really took me back to my formative years to see them feature in this film The film is currently free on Amazon for those who have Prime. Looks like I can watch it on Amazon Prime for free. Thank you for the recommendation. Not a big deal with the boots or as Billy Joel said in" Keeping the faith"
Yes, the 1970s -- the last flowering of the age of the male peacock. I hope it returns, and I'm fighting for that, but it's a rear-guard action to be sure and, I suspect, unlikely to succeed. Oh, well. The heels are not unusual for the era, the orange jumpsuit is a bit, but everything else is in keeping with the time. I forgot about The Dressmaker. This is a fantastically bonkers film that I've seen a few times. The cross dressing character is a camped-up caricature for comic effect, but the part is played well by Hugo Weaving and carries no malice. Kate Winslet is great in the lead role. This film is also available for free on Amazon Prime in the US. It's hard to find men in skirts in non-crossdressing and non-historical contexts. One I can think of offhand is Adam Scott's character in Hot Tub Time Machine 2. I guess my original motivation for posting this thread was to be able to comment on whether the guys in films wearing women's clothes would pass muster with the good people on this forum. 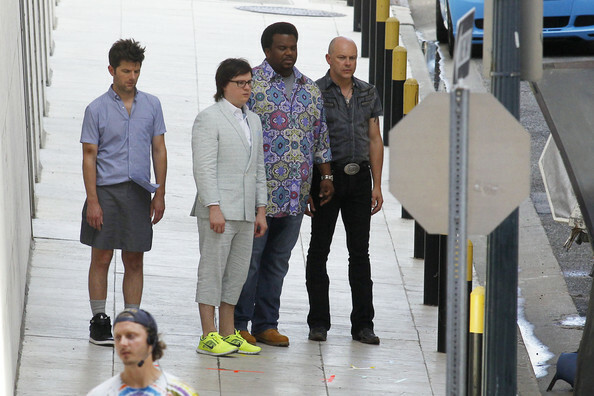 With this in mind, I think the Adam Scott outfit looks good and I'd go as far as to say that the Clark Duke ensemble looks to have been inspired by clothes from the other side of the aisle (they look like women's trousers and maybe jacket to me). "Iridescent socks with the same colour shirt and a tight pair of chinos. We were keepin' the faith." One of my favourites. Thanks for memory OS. FranTastic444 wrote: I forgot about The Dressmaker. This is a fantastically bonkers film that I've seen a few times. The cross dressing character is a camped-up caricature for comic effect, but the part is played well by Hugo Weaving and carries no malice. Kate Winslet is great in the lead role. I am going to watch this now. I have been almost completely bed ridden the last few days with my back. I need something entertaining, and hopefully this will be it. jmiller842 wrote: One of my favourites. Thanks for memory OS. and say, "Man what are you doing here"
Ah, the travails of youth -- when we were still allowed to live it and learn from it. Today's youth don't seem to get that for the most part, which is entirely sad, and by missing out on it they're compromised when mummy and daddy are no longer capable of taking care of them. A good film. We went to see it in the lovely old theater in Thalian Hall. I was skirted, needless to say. One of my favorites that had a brief bit of cross dressing was Billy Elliot. I'm not a Trekkie, butthis article reckons that male uniforms included 'the skant' at one point. I presume that this was on the tv shows rather than film? Was watching an old episode of “800 Words” tonight and noted a Maori character (male) wearing a long white skirt while officiating in a village cricket match. That was a nice treat. FranTastic444 wrote: I'm not a Trekkie, butthis article reckons that male uniforms included 'the skant' at one point. I presume that this was on the tv shows rather than film? I had heard about this before, and I've got a picture saved somewhere. Basically, they put skirts on a couple of the male extras who wander the halls of the ship in the background of few episodes.